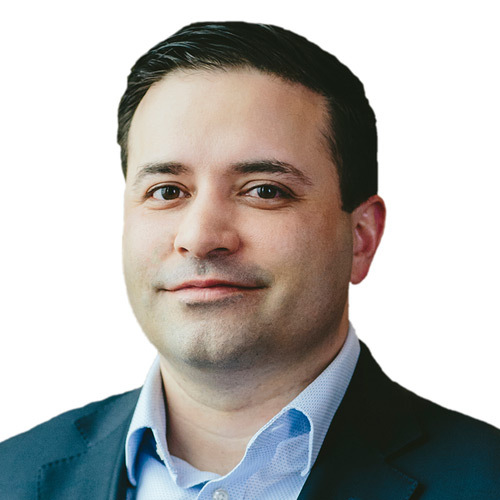 Ask any trader: markets deliver potentially newsy and stock-driving events that can be well-telegraphed and those that are surprises. Earnings releases—a regularly broadcasted quarterly company check-up—are one of the most important “known” events that allow traders to align a strategy in advance. And it can help knowing how to use the best tools and features on the thinkorswim® platform. The first place to start? 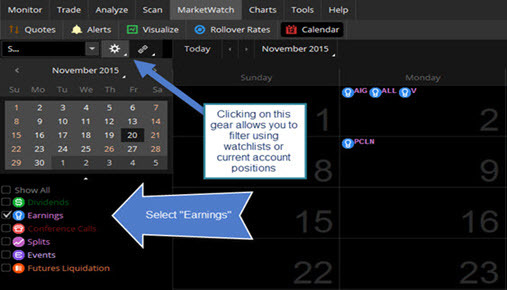 Identify publicly traded companies held in your portfolio that have scheduled upcoming earnings releases. By activating the “News and Corporate Actions in Position Statement” feature, it will become clear which holdings have a pending event, including earnings. 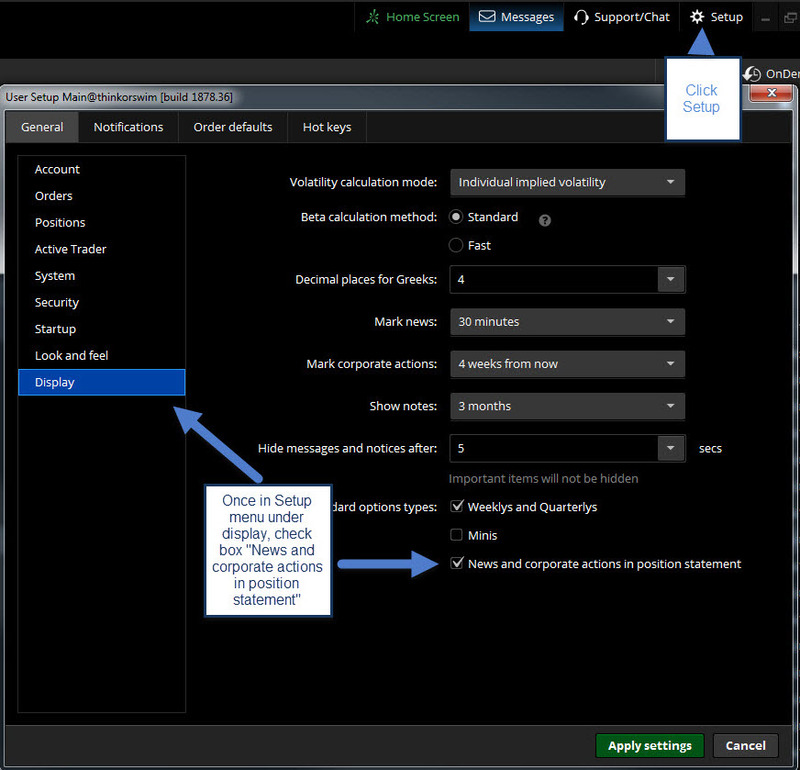 Activate this feature in the “Setup” menu found in the top-right corner of your platform (figure 1). FIGURE 1: TURN ON THOSE NOTIFICATIONS. Activate the feature “News and Corporate Actions in Position Statement” in the “Setup” menu found in the top-right corner of your platform. Source: TD Ameritrade’s thinkorswim® platform. Once this feature has been activated, you’ll see an icon next to the ticker symbol in your position statement indicating an event is occurring in the next eight weeks (figure 2). This only needs to be done once and you’ll automatically see icons next to the names in your portfolio with a relevant event or events. Unobtrusive, simple icons tied to events for listed stocks turn up next to your holdings. A lightbulb, for example, indicates an earnings event. Source: TD Ameritrade’s thinkorswim® platform. You’ll probably still need more information. The “Calendar” tool allows you to determine not only which company has earnings upcoming, but exactly when they’re due to report. This tool can display this information for a variety of different criteria. For instance, you might wonder: “What S&P 500 companies have earnings this week?” or “What companies in my portfolio have earnings this week?” The process is simple: Log into the thinkorswim® platform, click “MarketWatch” at the top of the screen, click “Calendar” and select the events you want to see on the calendar: day, week, month, or just a list. You can filter using the “Watchlist” tool in the upper-left corner (figure 3). Click “MarketWatch” at the top of the screen, click “Calendar” and select the events you want to see on the calendar: day, week, month, or just a list. You can filter using the “Watchlist” tool in the upper-left corner. Source: TD Ameritrade’s thinkorswim® platform. FIGURE 4: TURN ON THOSE NOTIFICATIONS. Your charts will now display icons at the bottom of the chart indicating corporate actions. You can see not only upcoming corporate actions but results from previous earnings periods as well as dividends. While still in the chart settings menu, you can also expand the time axis on your chart to show the next upcoming event. Note in figure 5, this is done in the “Time axis” tab in the settings menu by checking the box next to “Auto expand to Fit: Corporate Actions.” If done correctly you should now see the icons on the bottom of your chart (figure 6). FIGURE 5: AND COMING NEXT? 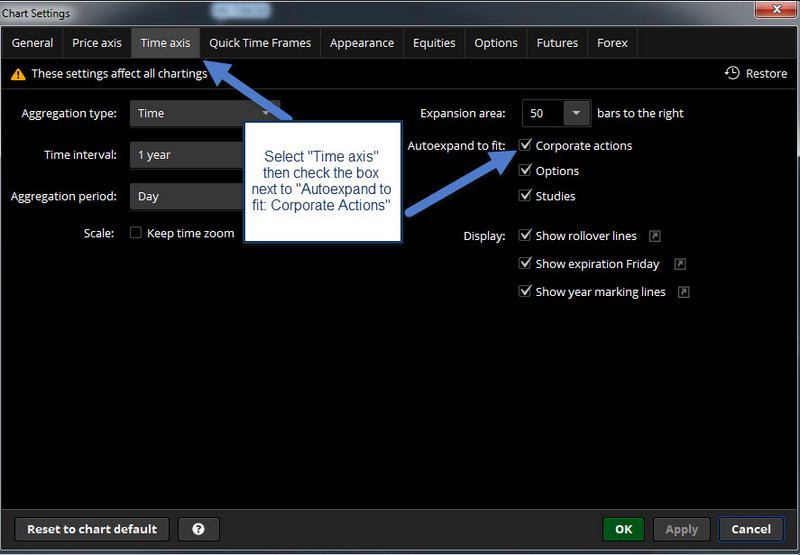 Select the “Time axis” tab in the settings menu by checking the box next to “Auto expand to Fit: Corporate Actions.” Source: TD Ameritrade’s thinkorswim® platform. FIGURE 6: FRONT AND CENTER. Chart configurations will make it clear when in chart history that earnings, dividends, and other events took place. 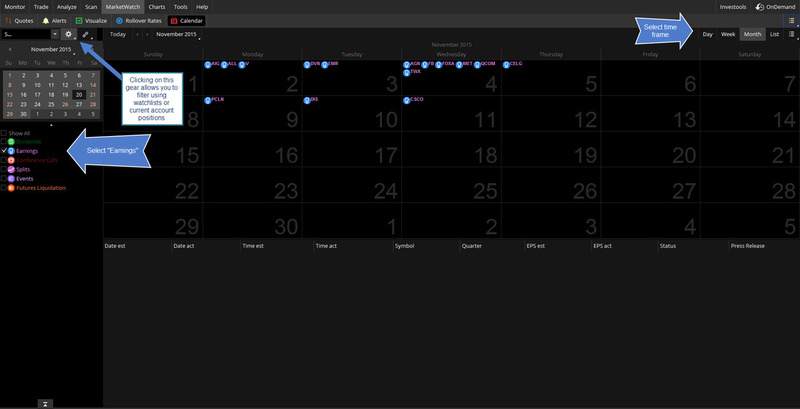 They also fill in based on your time settings for upcoming events. Source: TD Ameritrade’s thinkorswim® platform.